You don’t need a smoker to cook mouthwatering barbeque ribs, a simple charcoal grill works exceptionally well. Let me show you how to cook ribs on a charcoal grill! Did you know up until Facebook was invented none of the Father’s Day wishes actually counted? It turns out the only way to properly wish your dad happy Father’s Day is to post it generically on a social media platform he isn’t on and won’t ever see. Who knew, right? Well, one thing that will never go out of style is grilling up some ribs for dad, or with dad. I recently sold my smoker because I want to get an electric one that is better suited for smoking sausages. However, I have been too cheap and lazy to actually go to the store and buy my replacement smoker, so when I was craving BBQ ribs for Father’s Day I pulled out my Weber Charcoal grill and got right to work. First, you need to make sure you have the right equipment. You don’t need anything fancy, but you will need a full-size charcoal grill like this Weber Kettle Grill (affiliate link). The 22″ grate is needed to provide the lengthy ribs some space away from the hot coals. I also recommend picking up a chimney starter while you are at it. It is the easiest way to light charcoal and get a measured amount, for consistent grilling every time. 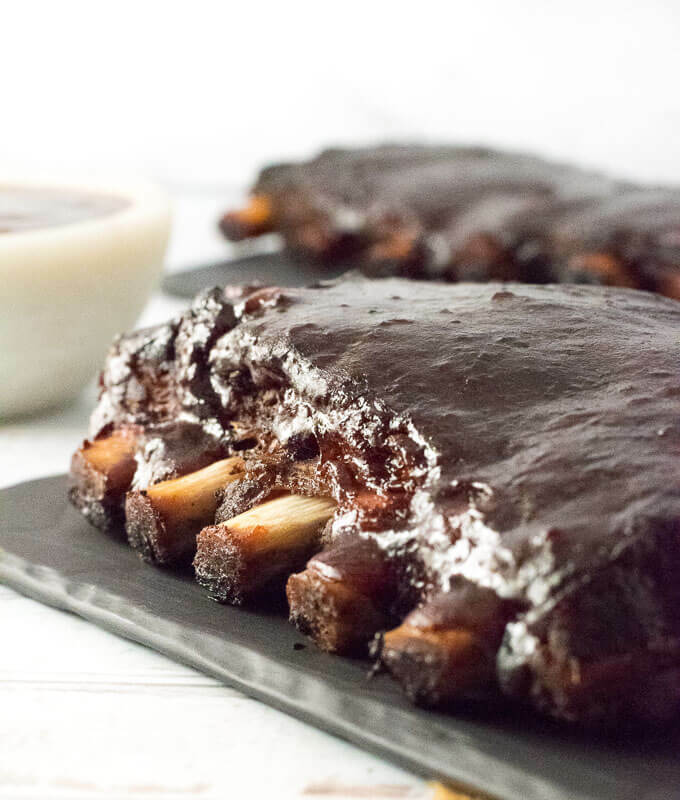 I like using hardwood lump charcoal for high heat applications such as searing grilled steaks, or grilled burgers, but it doesn’t work as well for cooking ribs over a long period of time. Instead, I prefer standard Kingsford Original Briquettes. They have a less intense heat and a longer, more consistent burn. Perfect for cooking ribs! The secret to making tender ribs on the grill is low and slow cooking. Low cooking temperatures allow the collagen in the tough meat to slowly break down and melt during the lengthy cooking session. If your ribs are tough they simply need to cook longer, as long as you have been cooking them at the right temperature. I recommend cooking ribs between 225 – 250 degrees. This is low enough to transform the ribs into mouthwateringly tender morsels of meat, without scorching or burning the meat while grilling. Higher cooking temperatures risk drying out the meat before it is sufficiently tender. OK, we have the right grill. We have the right charcoal, and we know what temperature to cook the ribs. Now we just need to put it all together and set up our grill. Fill a charcoal chimney half full with briquettes and light a handful of them. Once lit pour the charcoal on one side of the grill. Place the grate on the grill and set a pan of water on top of the grate above the coals (a disposable foil pan works well). This will help absorb temperature fluctuations and add humidity to the cooking chamber. The ribs will be placed on the grates furthest from the charcoal. Maintain the proper temperature by keeping the air vents mostly closed and dangle a temperature probe over the cooking surface to monitor the heat. Halfway through cooking you can add another half chimney of briquettes to the grill to keep the temperature from dropping. I recommend the 3-2-1 Ribs Method for cooking ribs in a smoker or on the grill. What is the 3-2-1 Ribs Method? Well, first of all, it is specifically designed for spareribs and refers to the length of time cooking. 3 hours smoking, 2 hours wrapped in foil, and then 1 hour unwrapped. 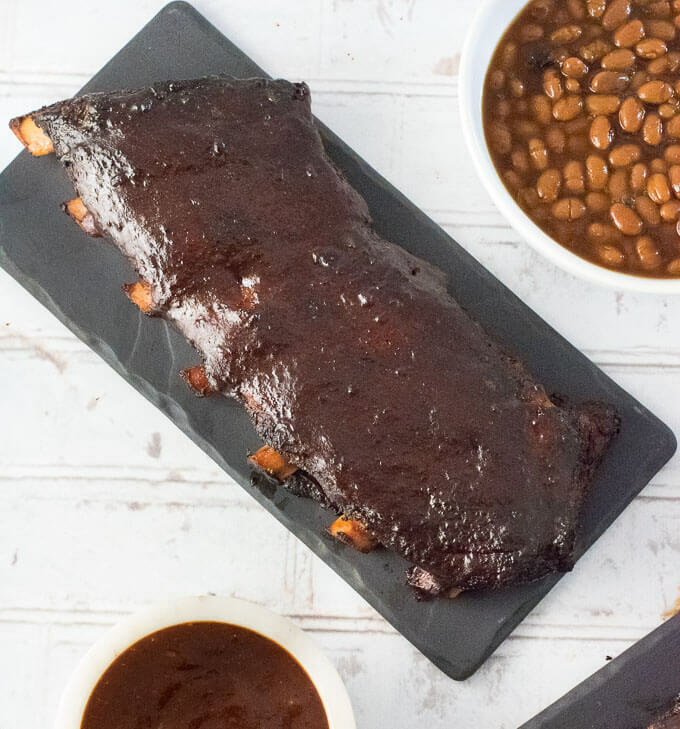 Following this method gives you perfectly tender ribs every time! If using Baby Back Ribs, use the same method but change it to 2-2-1. Baby Back Ribs aren’t as fatty so they don’t need as much time to tenderize. Troubleshooting Tip: If you are having a hard time maintaining a low temperature you will want to shorten the initial cooking period and wrap them in foil a bit easier. Otherwise, you risk the higher temperature drying out the meat. If you want to grill BBQ Ribs, and who doesn’t? You simply need a BBQ dry rub for ribs and/or your favorite homemade BBQ sauce. I prefer to use both, but you can use either based on your personal preference. Dust the ribs liberally with the dry rub prior to grilling, this can even be done the day prior if desired. The BBQ sauce will be applied to the ribs during the final hour of cooking. The heat from the grill will transform the BBQ sauce into a delectable sticky jam clinging to the meat! 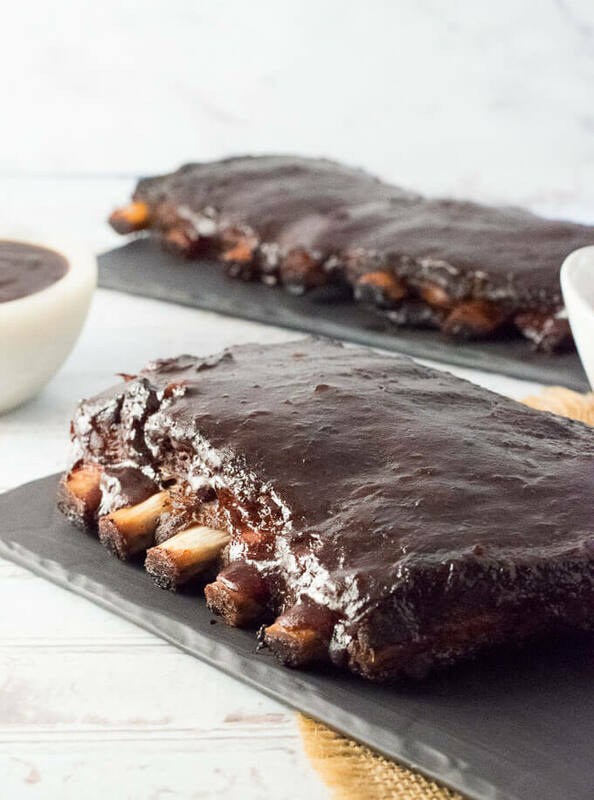 You can even make great BBQ ribs in the oven when it isn’t grilling season! For the love of God, NO! Rib meat should not fall off the bone. Fall off the bone ribs are simply overcooked ribs. This phrase was invented by crappy restaurants who’s ribs fall apart during the exceptionally long holding period before they are served. Any pitmaster worth his salt aims for the meat to be like an exceptionally tender steak. The meat should gently come clean from the bones when pulled, but NEVER should fall off the bone on its own. Rib meat falling off the bone will be mushy, featuring an egregious lack of texture. If you are going through all of the effort to cook ribs on a charcoal grill, you surely need some equally great side dishes to pair with it! My suggestion would be to cook up some grilled corn on the cob on the unused space of the grill, whip up a big batch of homemade baked beans, and some tantalizing homemade coleslaw! That right there is the perfect cookout! You don't need a smoker to cook mouthwatering barbeque ribs, a simple charcoal grill works exceptionally well. Let me show you how to cook ribs on a charcoal grill! Fill the charcoal chimney half full with briquettes and only light a handful of them to ensure the pile burns slowly. Place the briquettes in a pile against one side of the grill. Add 3 chunks of smoking wood, such as cherry, if desired. Set cooking grate on grill and place foil pan on the grate over charcoal. Fill pan halfway with water. Remove membrane from under the ribs by sticking a butter knife in-between membrane and bone. Gently work the knife around to loosen the membrane and pull completely off. Using a paper towel for added grip works well. Rub mustard around both sides of the ribs and generously apply rib rub. If not using a rib rub simply season with salt. Set rack of ribs on far side of the grill away from coals and cook at 225 - 250 degrees. Cover grill and cook for 3 hours if using spareribs, cook 2 hours if using Baby Back Ribs. 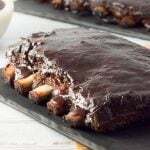 After 3 hours, wrap ribs in foil, adding 2 tablespoons of liquid, such as apple juice, and seal tightly. Add another half chimney of charcoal if needed and cook for an additional 2 hours with grill covered. Unwrap the ribs and discard the foil. Flip the ribs upside down and paint the bottom of the ribs with BBQ sauce. Cover grill and cook for 15 minutes. Flip ribs back upright and paint top of ribs with BBQ sauce. Cover and continue cooking for 45 minutes. Remove ribs from the grill, let cool slightly and enjoy! I recommend using a 22" charcoal grill or larger. If the grill is cooking too hot, shorten the initial cook time prior to wrapping the ribs in foil. For example, if the grill temperature is 300-350 degrees I would wrap ribs in foil 1 hour sooner. IF YOU LIKED THIS RECIPE you should check out my Grilled Country Style Ribs recipe too! 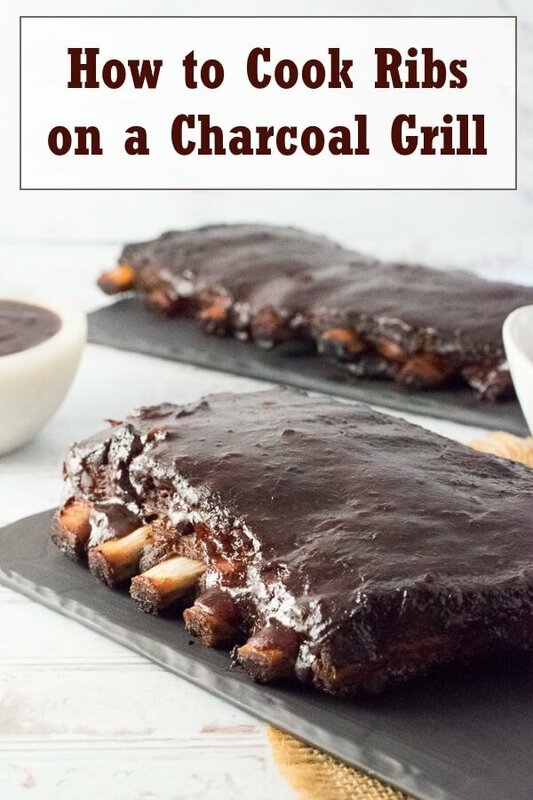 If you enjoyed reading my How to Cook Ribs on a Charcoal Grill then you should probably like me on Facebook and follow me on Pinterest too. That’s what I would do at least, because if you don’t get to know me but you still use my recipe it is kind of like taking candy from a stranger, and your mom taught you not to do that. Don’t disobey your mom, subscribe to Fox Valley Foodie today. Way easier to cook them at 250 in the oven covered with tinfoil for 2 to 3 hours in a good marinade sauce. Then put them on the grill for five minutes each side for the grilled taste. The meat falls off the bone, the low temperature is controlled far better, and the whole process is only two to three hours of easy cooking. I learned this method working in a restaurant that featured baby back ribs. 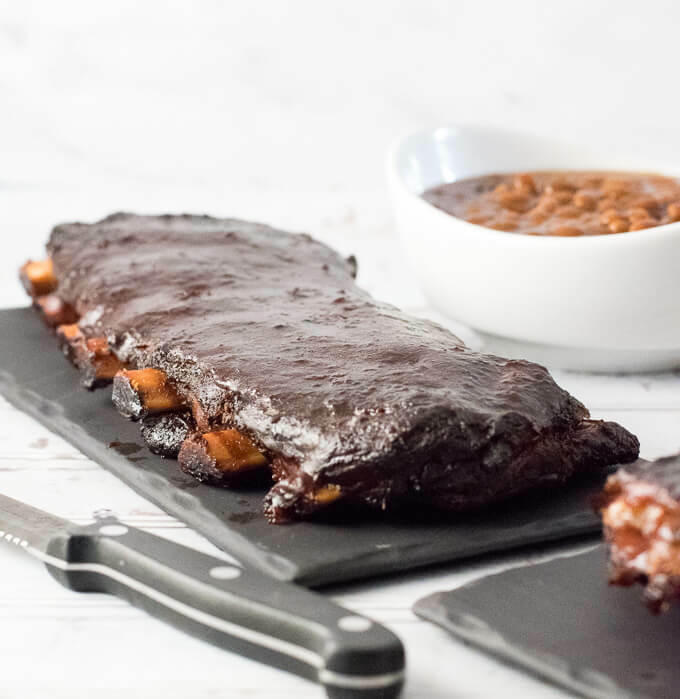 You are certainly right, if you are looking for easy ribs cooking in the oven will always be best, but if you are looking for maximum flavor grilling/smoking can’t be beaten! Last Wednesday I called Ben to ask him about doing ribs on the grill. I was making them for my wife for her birthday. He is right n the money about how good the ribs are cooked like this. He is pretty smart when it come to cooking now. Although, he didn’t like my Peanut Butter Soup I made for him when he was 4 or 5 years old. He also thought it was fun jumping around to see if my souffle would fall. Maybe some of my cooking school talent rubbed off on him after all. Great tips here! I am in no way a grill master so this is helpful – thanks! Perfect! That is exactly the crowd I am aiming for!